The leaves of the grape vine (Vitis vinifera) are an increasingly popular culinary vegetable, used in a variety of recipes from cuisines around the world. But more important, vine leaves are an excellent source of powerful antioxidant compounds with impressive health effects. 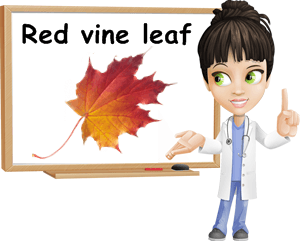 The red vine leaf, in particular, has been found to help improve conditions related to poor blood circulation, notably varicose veins and associated symptoms. Other uses for grape leaves in general include the treatment of symptoms of chronic fatigue syndrome, diarrhea, bleeding, sores, etc. The principle of action relies on the antioxidant, anti-inflammatory and astringent properties of the leaves, which manifest to a greater extent in red vine leaves. Despite the efficacy, extracts from red vine leaves are perfectly safe, while regular consumption of grape leaves of any sort is very well tolerated. What do (grape) vine leaves look like? Vine leaves, also called grape leaves, are large, bright to deep green, orange or red heart-shaped leaves. Leaves can be a uniform color or, in the case of red ones, a combination of shades from the same range of colors. They are similar in appearance to maple leaves. Generally, vine leaves have 5 lobes and pointy, either smooth or toothed edges. Leaf appearance may differ slightly depending on age or variety. But you’ll still know what a vine leaf looks like despite the lack of grapes. What do (grape) vine leaves taste like? Grapes are incredibly succulent and flavorful fruits. However, grape leaves have a sort of bland, leafy green flavor with a slight, barely noticeable bitter aftertaste when cooked. Vine leaves in the kitchen. Most recipes employing vine leaves require for them to be boiled, blanched or steamed and then stuffed. Blanching or boiling is required to make the leaves soft and easy to chew. Stuffing recipes usually require large, mature leaves which need preparation to become palatable. The stuffing is made from either minced meat and herbs and spices or rice, raisins, plums, various herbs or cheese, other vegetables. etc. The leaves are rarely eaten fresh. They are available canned, in brine or can be picked and frozen. There is little research on the nutritional properties of vine leaves. Some studies say they contain good amounts of vitamin C, others that they are a moderate source of calcium or magnesium. Some say they contain healthy Omega-3 fatty acids. However, more research is needed to confirm these facts. 1) Natural remedy for varicose veins. 2) Reduce swelling and edema. 5) Excellent source of antioxidants. According to research, red vine leaves owe all of their health effect to their antioxidant content. Antioxidants found in red vine leaves include flavonoids (quercetin-3-O-beta-D-glucuronide, isoquercetin, myricetin, kaempferol), catechins, epicatechins, anthocyanins, procyanidins and proanthocyanidins. 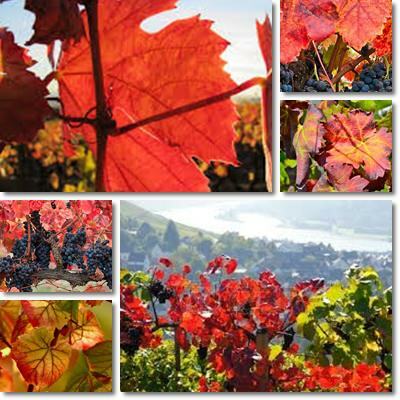 Other famous antioxidant compounds in the leaves include resveratrol, also found in grapes and grape wine, and viniferin, the main bioactive constituent in grapevine sap. (Phytopharmacy: An evidence-based guide to herbal medicinal products). Numerous studies report that the antioxidants in red vine leaves and the subsequent red vine leaf extract are efficient for the treatment of varicose veins, also known as chronic venous insufficiency. The extract has successfully been used in clinical trials to prevent edema (swelling) and other symptoms associated with the condition. Following a 42-day study, subjects reported an improvement in symptoms such as: tiredness and fatigue, pain, tingling and tension sensation in the legs (Oedema protective properties of the red vine leaf extract AS 195 (Folia vitis viniferae) in the treatment of chronic venous insufficiency. A 6-week observational clinical trial). More studies have been published with time and all revealed red vine leaf extract as a promising treatment for varicose veins. In a 2004 study, the extract was shown to improve blood flow in the smaller blood vessels of the body (capillaries, for example) and oxygen circulation, as well as reduce leg width as a result of better circulation. Because it improves blood flow to various areas of the body, red grape leaf extract is used for the treatment of hemorrhoids. Antioxidants in red vine leaves help protect cells and DNA from damage buildup caused by free radicals and prevent them from altering normal cell activity that could turn regular cells into cancerous ones. Free radical damage buildup, known as oxidative stress, causes extensive inflammation which is a risk factor for chronic disease. A 2012 Japanese study revealed that red vine leaves extract holds anti-inflammatory effects and may contribute to reducing liver damage. Antioxidants in general exhibit anti-inflammatory properties as well and can help reduce swelling and pain associated with inflammatory conditions. These biological active compounds also exert antimicrobial effects. A 2011 study from the International Journal of Food Properties revealed that red vine leaves hold strong antimicrobial properties against Staphylococcus aureus, Escherichia coli and Salmonella Infantis (Phenolic Profile, Antioxidant Capacity, and Antimicrobial Activity of Leaf Extracts from Six Vitis vinifera L. Varieties). Last but not least, red vine leaves extract contain resveratrol, a potent anticancer agent. Preliminary research suggests resveratrol has a particularly strong anticancer action when in direct contact with a certain part of the body, hence its effectiveness at preventing stomach or skin cancers. The compound also boasts photoprotective effects, meaning it protects the skin against dangerous radiation from the sun, hence its anti-aging effects. The use of red vine leaves for wound healing might be explained by the reparative properties of the antioxidants it contains. Resveratrol may engender cardiovascular benefits. While eating grape leaves on a regular basis does not produce any side effects, taking pure extracts made from red leaves can engender moderate side effects such as gastrointestinal discomfort. However, stomach problems have been shown to resolve themselves and are only encountered when recommended doses are surpassed. Overall, red grape leaves are an excellent natural remedy for varicose veins, wonderful antioxidant, anti-inflammatory and cancer-preventive agent as well as strong natural antimicrobial.